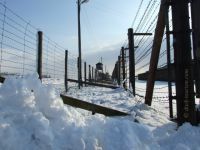 A former concentration camp and death camp set up by the Nazis near the town of Lublin in the south-east of Poland – as the first one of its kind in this occupied territory. Madjanek was also one of the first such places to be declared a memorial site, straight after its liberation in the summer of 1944, i.e. while World War II was still raging. A sizeable proportion of the original buildings and the camp grounds are still intact. 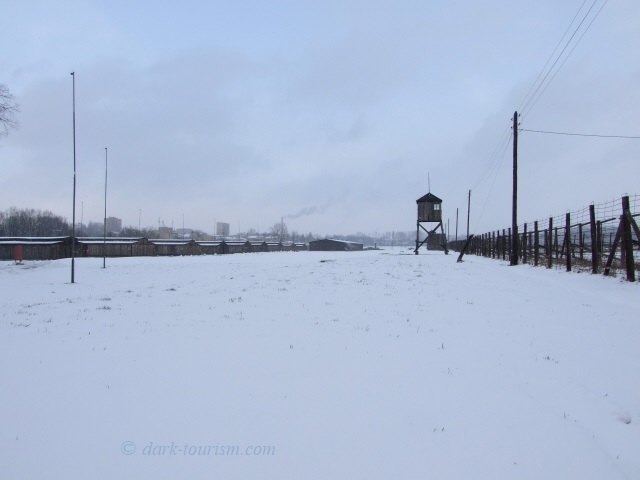 Despite this, it is one of the lesser visited such Holocaust sites (but still draws around 100,000 visitors annually) simply because it is located much further off the beaten tourist tracks than, say, the more accessible sites at Auschwitz, Dachau or Sachsenhausen. However, in my view Majdanek is possibly the most impressive such Holocaust memorial site of them all. More background info: Following a visit to occupied Lublin by Heinrich Himmler, the camp in the Lublin suburb of Majdanek was set up, from late 1941, initially as a POW camp, officially at least. But before long it took on the character of a full-blown concentration camp, in which the principles of deprivation, random violence and, ultimately, "extermination through labour" ('Vernichtung durch Arbeit') were applied as much as they were in other such camps. 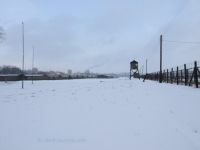 The victims of Majdanek were primarily Polish Jews, but also POWs from the occupied Eastern European territories, in particular the Soviet Union. 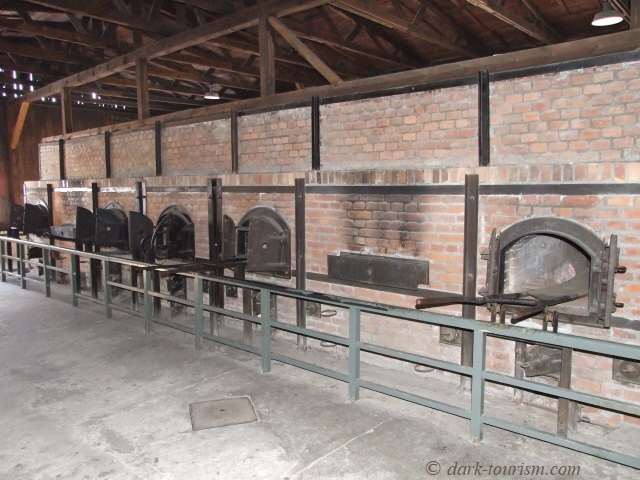 Many people were murdered in mass shootings, but Majdanek was also one of those camps in which gas chambers were systematically used; just as in Auschwitz, the infamous gas Zyklon B was employed here (as opposed to most other such places which used carbon monoxide). 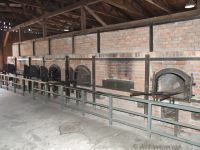 To this day blue coloration resulting from chemical reactions can be seen on the inner walls of the gas chambers. 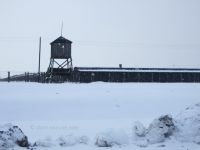 Estimates of the numbers of inmates who died at Majdanek vary – figures initially suggested apparently were way too high. 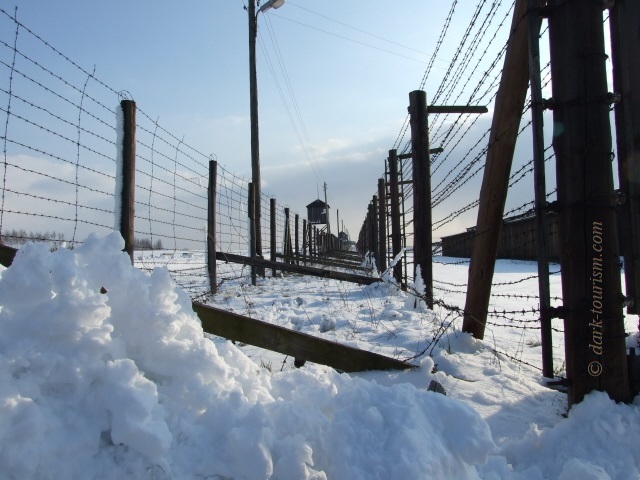 Today it is assumed that the total death toll of the camp was "only" around 80,000. 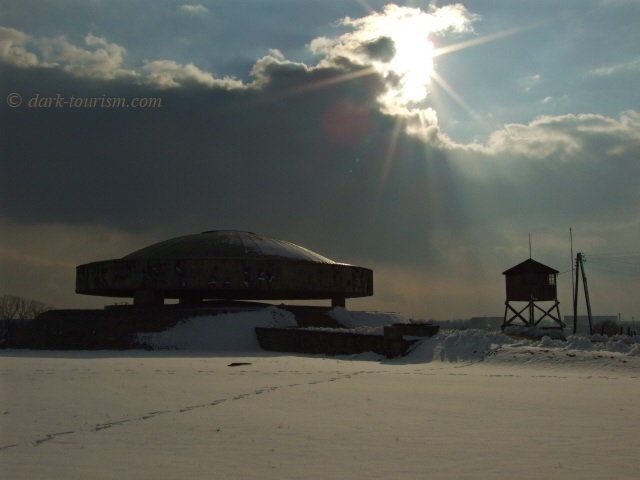 It was already in summer 1944 that the camp was evacuated by the Nazis, as the eastern front started to close in. And in this case the usual attempts at covering up the evidence of what had happened here were particularly half-hearted and superficial. Thus it fell into the Soviet liberators' hands almost completely intact and was presented to journalists as early as 10 months before the end of WWII. They were able to form a gruesomely clear picture of what the Nazis had been up to here and reported all this in the West. It is also in this respect that Majdanek assumes a special place in history. What is less clear is the classification of Majdanek as a designated death camp within "Operation Reinhard" (unlike with the "pure" extermination camps of Belzec, Sobibor and Treblinka). 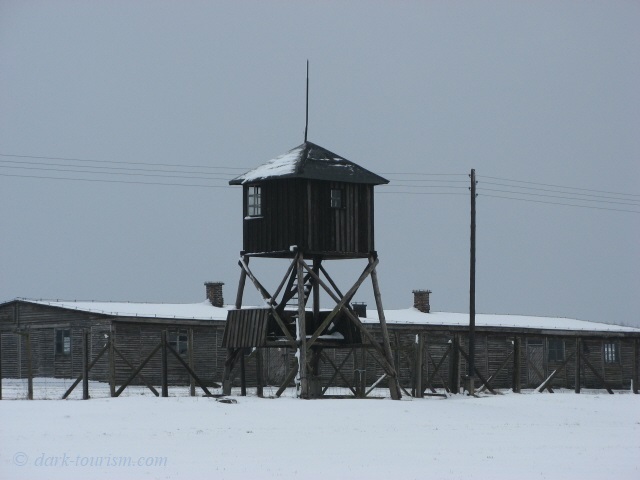 Another problematic aspect about Majdanek's early post-war history is the fact that the Soviets continued using part of the site as a POW camp (see also Buchenwald and Sachsenhausen), where they also interned many members of the Polish underground Home Army AK. The latter is still a sensitive point psychologically in Polish-Russian relations (see Warsaw Uprising Museum). Majdanek may be far less well-known than Auschwitz, but is (almost) in the same league. 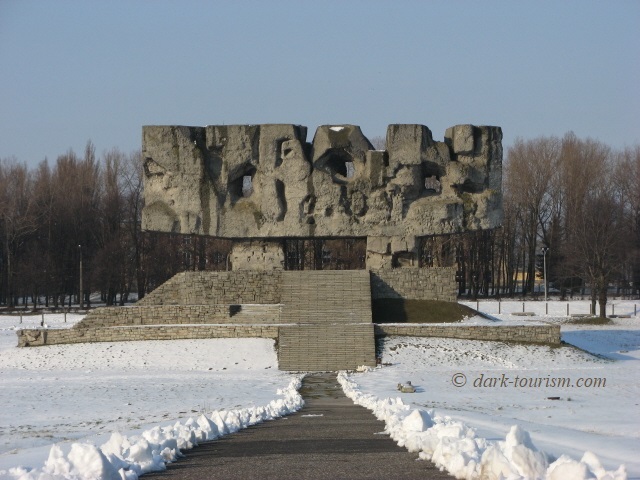 No dark tourism trip to Poland would be complete without a thorough visit (or two) of this impressive site as well. It's as good as obligatory! What there is to see: Majdanek has to be regarded as the best-preserved of all the former Nazi concentration camps in the whole of Poland. 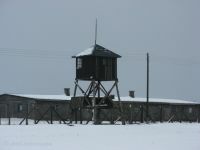 The site hits you immediately with its long sloping row of watchtowers connected by barbed-wire fences. The area inside the fences was subdivided into separate fields of wooden barracks that the inmates used to be crammed into. A few rows of such barracks are still in situ. Today, some of them house exhibitions, others are reconstructions of the stark living conditions – with the characteristic rows of densely packed bunk beds. 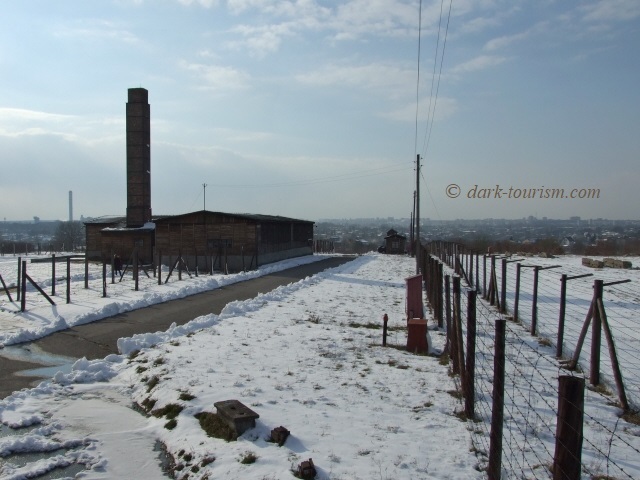 Several of the buildings in the 'works' parts of the camp are also preserved, and, in particular, the gas chambers, the shower rooms, as well as the "new crematorium" at the top of the complex form gruesome testimony to the horrors that took place here. At the other, lower, end of the site, next to the main entrance, a newer building houses the site's administration as well as a cinema in which a film about the camp's liberation can be shown to visitors. There's also a small shop selling books and a few other bits and pieces. All this is noticeably less touristy than e.g. at Auschwitz. It is obvious that significantly less commercialization has reached Majdanek (so far). The area of the former camp that faces the main road is dominated by a huge monument dating from 1969. This displays the full "clout" of monumental style of socialist memorials from those days. Next, further towards the main camp area, the house of the former camp commandant is still there. And then there's the camp proper with its rows of watchtowers and the rows of barracks. In between those barracks there are also a couple of sculptures made by former inmates themselves. 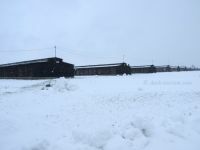 One of the camp's five constituent fields of living quarter barracks is still complete – the remainder are empty fields. Even so, the position of the complete rows of barracks in the central part of the camp's area still creates a fairly good impression of what the whole camp must have looked like. At the far end of the compound there's another huge monument dominating the scene: this is the Mausoleum. 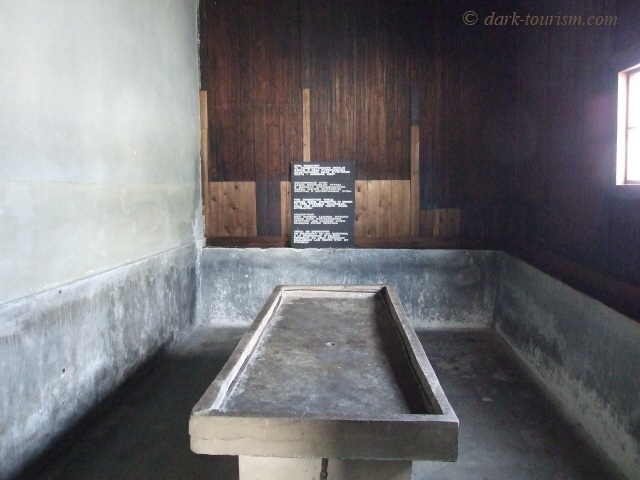 This consists primarily of a gigantic concrete dome over a huge mound of ash – the remains of those murdered at the camp and cremated in the ovens of the adjacent "new" crematoria. It is thus especially at this spot, by the Mausoleum, that the site assumes the sombre atmosphere of a cemetery, further enhanced by the wreaths and candles placed at the head of the Mausoleum. Beyond this lie the mounds of earth under which the victims of the mass shootings of 1943 were buried. The building next to these is the former crematorium. Here it is principally the ovens, which look almost as functional as if they were new, that leave a deep impression on the visitor. Similarly shocking, though, are those parts of the 'works' buildings, located outside the rows of barracks of the living quarters. In one of those works buildings an original gas chamber can be seen, complete with the blue discoloration on the walls and the ceiling caused by the chemical reactions. There's also a storeroom, stacked high with old Zyklon B gas canisters! In another barrack countless shoes formerly worn by inmates are piled up in three long wire mesh cages. This is reminiscent of similar exhibits of amassed former inmates' belongings at the museum of Auschwitz 1. There is little further explanation, and the information that is provided in the few text panels that have been put up tends to be very brief (but in five languages: Polish, Russian, English, German and French). Some criticize this as too little educational contextualization. In my view, however, this lack of textual distraction actually has a positive effect: since you are not constantly digesting textual information to the point of information overload, there's more room for getting a "feeling" for the place. You can simply afford more time for this instead of being busy gathering historical information. I would presume that Majdanek is likely to be only for the "advanced" visitor who is already quite familiar with the whole subject matter anyway, so I don't think that much harm will be done by the sparseness of background information. Even in the rather unlikely event (at least for foreign visitors) that this should be the first such site a person visits, then this would probably rather create a desire to learn more – a desire that the bookshop can cater for in the first instance. Or it may make such a visitor want to see further, more elaborately informational sites of other former concentration camps elsewhere. Majdanek itself, it has to be conceded, is indeed not the most didactics/education-oriented sites of this type. But I found it most impressive all the same. 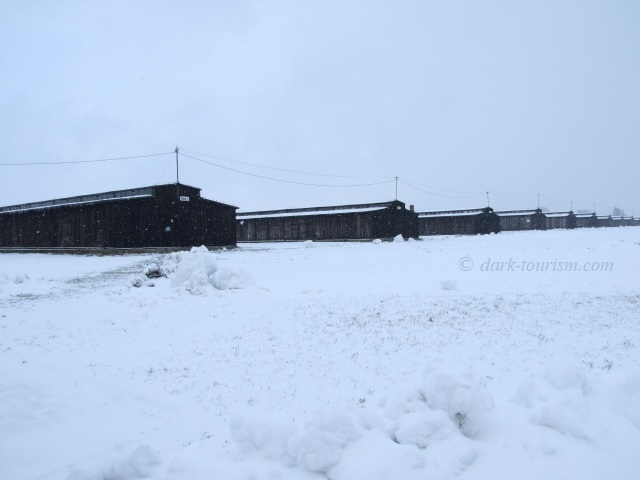 Two particular aspects made my own experience of the visit to Majdanek (in early April 2008) different to that at other concentration camp memorials in yet more ways: a) the emptiness, and b) the weather. It was early in the season and so there were hardly any other people about. Most of the time nobody else was to be seen. There was one group of visitors that arrived a bit later but they remained so far behind on the long circuit around the camp that for much of time I didn't even notice them. And then there was the weather: winter had made a surprise return (and that after Easter) with a blizzard that gave the place an additional eerie element, namely by the snow taking most of the colour out of the scenery. 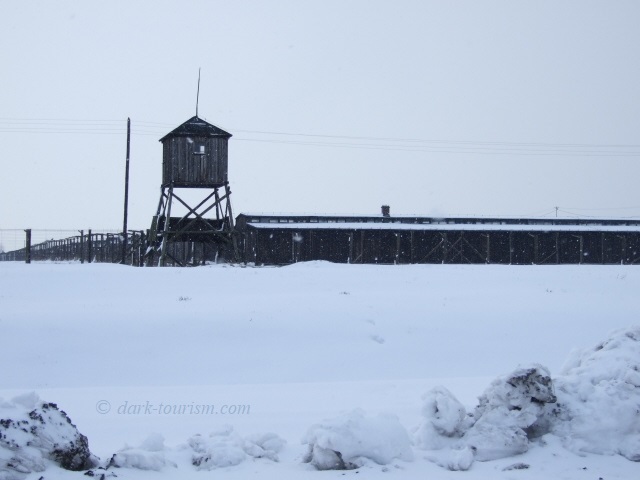 The snow on the ground contrasting with the bleak dark shapes of the barracks and watchtowers almost created the illusion of everything being in black-and-white. In summer, it must all look very different, greener – and presumably you can expect larger numbers of visitors too. But I would still guess that this site could provide a good contrast to visits to such overcrowded places as Dachau or Auschwitz. That's why I strongly recommend that you do not only go to Auschwitz. 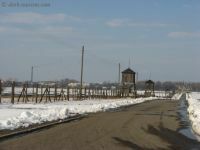 And if you have time for only one other concentration camp memorial site, then make it Majdanek! Location: in the south-east of Poland, in a southern suburb of the city of Lublin, ca. two to three miles (4 km) from the city centre. Lublin is the administrative capital of the province of the same name and is about 100 miles (160 km) south-east of Warsaw and about 60 miles (100 km) west of the borders with Ukraine and Belarus. Access and costs: a bit remote, but not too difficult to get to; fairly inexpensive. 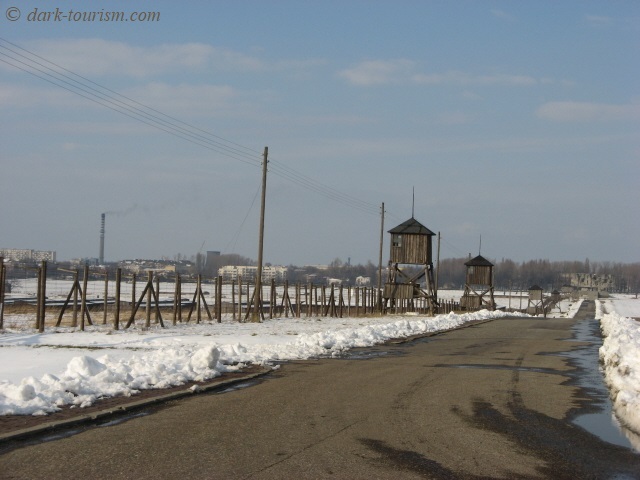 Details: For travelling in the east of Poland on an individual basis having your own vehicle is not only practical but almost indispensable – especially if you intend to combine a visit to Majdanek/Lublin with other sites (e.g. Belzec and/or Sobibor) in this fairly remote area (see below). Getting to Lublin as such is, however, perfectly feasible by public transport – there are regular train connections to/from Warsaw (ca. two to three hours journey time), and also from Krakow (twice daily, ca. five hours journey time). Lublin's train station isn't particularly centrally located, though. In order to get to Majdanek from the centre of Lublin you'll need to use local buses – since the name of the site is also the name of the suburb it is located in, this even shows on the front of those buses going there (e.g. line 153 and 158 from the centrally located street ul. Lipowa). You can't miss where you have to get off: just look out for the gigantic monument which is near the site's entrance. Opening times: all year Tuesdays to Sundays from 8 a.m. to 4 p.m. Admission to the grounds is free, but there's a small parking fee levied at the car park near the main entrance (only 5 zloty per car in 2008) – you can also drive on further into the area and park at the Mausoleum or near the entrance to the 'works' part of the camp. You also have to pay to see the film shown in the cinema of the main administrative building by the entrance (again, cheap: only 3 zloty per person). Nominally, there's a minimum number of viewers per screening, but we were shown the film and there were just the two of us – we just had to pay a little extra to make up for the absence of other viewers (15 zloty is the nominal minimum fee). Guided tours of the site are available but have to be pre-booked in advance (at least a week ahead). Tours in English cost 150 zloty for smaller groups, 200 for 11-30 persons (only 75/100 zloty for tours in Polish). There are also more elaborate study programmes lasting a whole day or more. 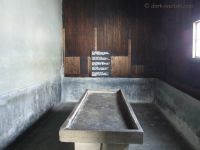 Personally, I'd always prefer a quiet self-guided visit at this site, so that you can really take in the intense atmosphere of the place to the full – always better to be had silently and without group dynamics. A private guided tour may be a different matter, though (as I experienced at Auschwitz). Time required: Officially, the complete circuit of the site is said to take two to three hours (plus time for the film screening). That sounds about feasible, but if you really want to take your time it may be a slightly tight estimate. For an unhurried exploration of the entire site on foot you may need to allow an extra hour or two. Plus getting there, of course. I actually spread my own visit over two days. Combinations with other dark destinations: If you're thinking of travelling to this fairly remote south-eastern corner of Poland, then you might just as well consider taking in the impressively modernized/reworked memorial at Belzec nearly 100 miles (150 km) further south-east from Majdanek close to the Ukrainian border. Another possibility is also Sobibor which is about 60 miles (100 km) to the east, but in an even more isolated and forlorn woodland location. Both can be done as (separate) day excursions from Lublin, provided you have your own vehicle (otherwise, e.g. by bicycle you might end up needing accommodation closer to those sites). 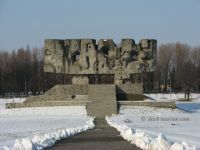 In theory, a similar trip could be made to Treblinka too, but since that is located in a very isolated spot some 150 miles (250 km) to the north of Lublin it may be too far for a day return excursion and should possibly rather be done as a stop en route e.g. to Masuria (see Wolfschanze near Gierloz). Only a bit over 20 miles (30 km) to the north from Lublin there's a part of the museum complex at Kozlowka that may be of some interest to the dark tourist too, namely an exhibition of socialist realism art. That includes mostly old propaganda posters from Poland's communist years, as well as effigies of the whole set of associated great leaders, i.e. the likes of the Soviet Union's Lenin and Stalin, China's Mao, North Korea's Kim Il Sung, Vietnam's Ho Chi Minh and Cuba's Fidel Castro. En route to Belzec you'll pass Zamosc, whose rotunda contains a small museum about that building's dark chapter during the Nazi occupation. Lublin itself is worth some attention too – in particular the castle could be of special interest to the dark tourist. The Nazis used parts of the castle as a prison and an execution yard – at the time of my visit (in April 2008) the related exhibitions about that period were closed for restoration and thus inaccessible but meanwhile they surely will have reopened. There are also traces of former Jewish life to be found in Lublin – in fact, it is probably "Jewish Roots"-themed tours that bring in the largest numbers of foreign visitors to this place. I saw several groups from Israel and the USA flocking to the old town centre at the time of my visit. To cater for these, there are numerous text panels and signs dotted around the old town that mark places of interest from a Jewish heritage perspective. And several Jewish cafés/bars and restaurants cater literally for this clientele specifically. I went into one of these too and found it an extremely loveable, old-fashioned but warmly welcoming and friendly place. I can't remember its name but it was located at the north-eastern corner of the Rynek (old-town square). Combinations with non-dark destinations: The old town centre of Lublin is exceptionally pretty and unspoilt and as yet nowhere near as overcrowded with tourists as Krakow's. As such it's well worth a visit in its own right! The countryside around Lublin is somewhat less spectacular than other parts of Poland, but it does include a couple of fairly visitable quaint places too, such as Kazimierz Dolny or Sandomierz. Chelm (not to be confused with Chelmno!) is another particularly pretty place, located some 40 miles (65 km) east of Lublin (en route to Sobibor). Its underground chalk chambers provide a charming little attraction of a very unusual kind. Guided tours include a cute little ghost impression performance by one of the employees … which I found exceptionally endearing (see the photo in the Sobibor gallery).